Mysterious omens could wait. Witches knew that mysterious omens were around all the time. The world was nearly always drowing in mysterious omens. You just had to pick the one that was convenient. and “‘there are times when ye should stick your head up a duck’s bottom rather than talk'”. A book about responsibility, scheduling, and the odd bit of magical happenings. The songs sung at the Baron’s funeral are: The Larks They Sang Melodious (also known as Pleasant and Delightful and as Charming and Delightful). YouTube. Dance, Dance, The Shaking of the Sheets (link has interesting reference to variant by William Cobbold, 16th/17th century composer). Dull version by Faran Flad here. Down in the Valley. Lyrics. Rather plodding YouTube. Liz Paludan, 1986, English translation 1995. Two blog postings on the author here and here. I like the peacock in the second link. 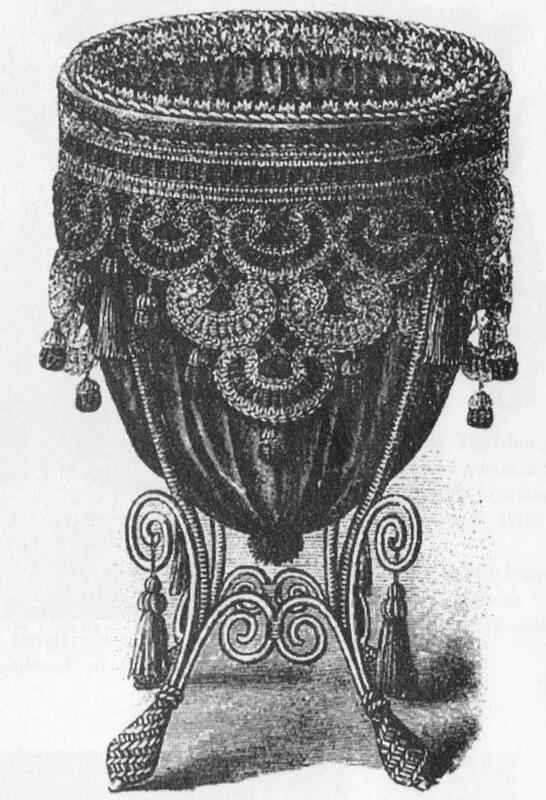 1885 linen basket trimmed with crochet – the basket itself is painted in gold-bronze and the cover includes dark red plush and satin, glitter and gold lamé. 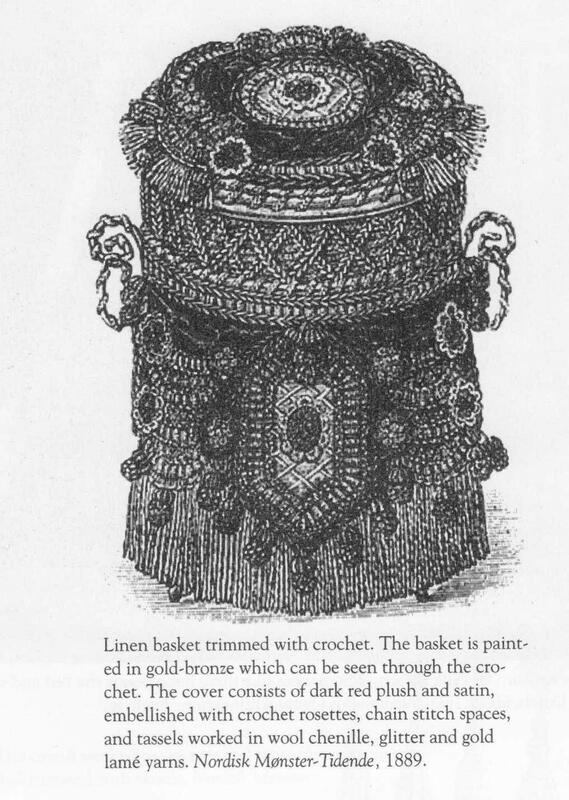 Woollen bin on a stand, trimmed with crochet in dark blue, blueish-gray, olive and light brown, 1890. Oh, and the stand is bronze. Reminds me of Mercedes Lackey’s Shin’a’in who had never met a colour they didn’t like. And do embroidery but not crochet as far as I remember. Anyway, stuff, not so gloomy as previous stuff, though dull of course. So I’ve been thinking of entering a short story (or stir-fry, as I originally writ) competition for wch the theme is Journeys. Made me think how few actual journeys there are in my writing. Of course one can always interpret it metaphorically if entering, but that seems wrong somehow. My characters do go places but it’s always very short and fairly mundane trips – into the wood, to the bookshop. Maybe I ought to write about longer journeys. Or not, who knows. Let’s get the stuff out of the way first. No-one wants the stuff. I was playing a pretend game with the H and the M today to keep them occupied whilst adult stuff (or dull stuff, wch is often the same thing) happened. I was a taxi driver (we were in the car) driving them along the beach. I noticed different responses from them. When I said anything was happening that the M didn’t like, she said “let’s not have that”. So at one point I said the H had nearly fallen out of the car but just saved herself, the M said “let’s not have her having fallen out”. And at another point I said we’d passed their parents on the motorway and they were looking sad because they were going to work, and she said “let’s not have them looking sad”. The H did some complicated bits of entering into the spirit of. So at one point I handed them imaginary bottles of water and she passed it back to me saying it was too difficult to open. And when they had imaginary ice-creams she handed the cone back saying she didn’t want to eat that part of it. So I guess I’m reading that as the M identifying things as “bad” and editing them out and the H being particularly free with imagination. Who knows. I always feel squicky writing about writing. I mean, if I were doing successfully I wouldn’t need to mention it, would I? And it’s salutary / terrifying / needs further analysis that there are 402,000 Google results for “really trying to write”. Though some of that is about lyrics, homework, or randomness, rather than writing-writing. Anyway, having got the shame markers out the way, I’ve been “really trying” to write – that is, to type rather than scribble, as for me however much I scribble the writing up and redrafting on the computer is more important in moving the story along. That’s partly because I can’t easily read my own handwriting in bulk, so if I write more than a few pages by hand it gets difficult for me to get a sense of it quickly. Also for some reason I tend to write far too much dialogue when I’m writing by hand, and need to type it up to incorporate the descriptive stuff I’ve written in my head and invent the moving-the-plot stuff that is always hardest for me. Wch is an involved way of saying the typing-up / writing on computer bit is important to me. For some reason it’s also the bit I am finding really hard at the moment. I don’t know if it’s because it adds another level of earnestness or Taking Myself Seriously or something. So I can, and do, write reams of stuff in notebooks, as long as it’s in fairly short bursts, and don’t have any problems revising it either, but as soon as I sit down to type it it sets off moderately extreme panic attacks. By wch I mean I’ve had worse, but the last three of these have taken around 6 hours to come down from, wch is a lot of time to waste. And of course once you start seeing a pattern with PAs you’re pretty much doomed. Tried writing on different computers, different places, no change. Tried fict and non-fict. Anyway, I could probably have slipped “I” in a few more times in that download. The book’s by Geert Mak, 1994, trans Philipp Blom, 1999. The description of the structures of older houses remaining inside newer ones. “during demolition … opposite the Central Station, an almost pristine wooden skeleton of the house of a medieval merchant came to light, complete with the usual rigging construction”. It was from the 14thc and has apparently been put into store, whatever that means. The description of the inner and outer parts of Amsterdam houses. a clear division between the private and the public in the Amsterdam house itself. We know the “voorhuys” or front house well from the paintings of Jan Vermeer, Jan Steen and other seventeenth-century artists. It was high, light and open, and normally used as a shop, merchant’s office, or workshop, and also as a living space. In the summer, the shutters and the door would be left open at all times, though the lower half of the door might be kept shut on account of the many stray dogs roaming the city. The inner hearth, however, was intimate and enclosed. Here Amsterdammers hid themselves away from the cold and from their hard lives. Such drawings and paintings of those inner rooms as have come down to us breathe an air of blissful indolence: pipe-smoking men and knitting women. The dual nature of this domesticity was to characterize the city for centuries to come: on the one hand the cordial openness of the merchant who meets his customers in the front house and will close neither shutters nor curtains at night, on the other, the contained, private life of the inner hearth, that curious atmosphere which the Dutch delineate with the word gezelligheid, the smugness which is soft on the inside and hard on the outside. They stand behind a table on which we see objects heavy with symbolism: an hourglass, an accounts book, a handful of gold coins, an inkpot, penknives, a ball of spinning thread. In the background we look through a window on to a landscape in which Christ hangs upon the Cross, and in the foreground there is a chapless skull. On the right-hand side of the painting are two more symbols of domestic industry: a shelf full of business letters on which one can read, just, the name of the man, and on the wall the woman’s broom. In order to accentuate even more the transience of our existence, the couple are pointing demonstratively to the hourglass and the gold, for work one must, time is running out, and one should not indulge in vanity. 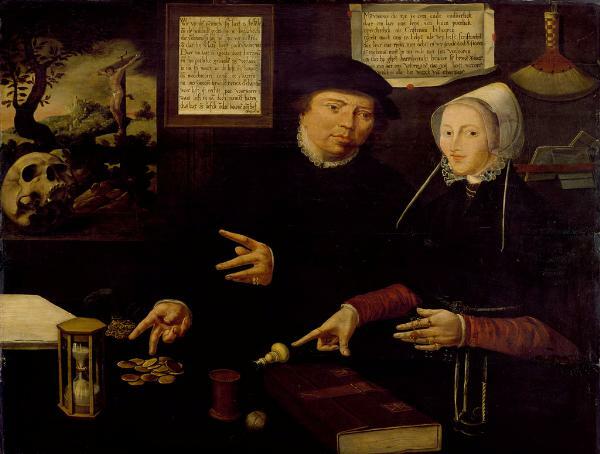 Cedit Mors Nemini, death spares no one, is painted on the wall behind the merchant, while behind his wife is a maxim for later generations that can be summed up as: life is short; live honestly and as Christians; and if you are rich, you are duty bound to share your possessions – on pain of the fires of Hell. Mak later discusses the Women’s Uprising, a group of rich women who travelled to Brussels to appeal to Emperor Maximilian – unsuccessfully – about the city’s plan to put a commercial building in the courtyard of Amsterdam’s Holy Place, the site of a fourteenth-century miracle. One of these women was Gerrit Janszoon Peggedochter, whom Mak thinks is the woman in this painting: someone who “ranked [her] religious sisterhoods and ties more highly than [her] social status” (though of course her social status may have been fairly tied in with her religious behaviour), and he quotes the text from the painting: “Therefore let us accomplish what God has elected us to do, which is all the work of charitate“. Interesting account of a lecture the writer gave in 2003 (Google translation). 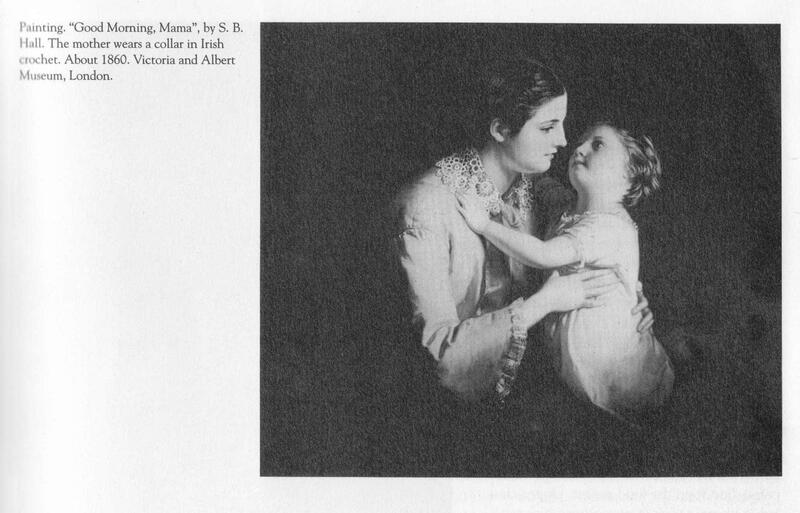 You are currently browsing the Books and Pictures blog archives for May, 2011.